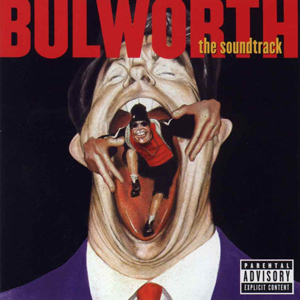 Ratti Entertainment received a platinum album for the hit soundtrack to Bulworth. Jay Bulworth is your typical senator going through a nervous breakdown. The empty speeches, lies, money, and pressure have led him to plan his own assassination on a weekend trip home to California just before the election. However, a cord snaps in him and like Jim Carrey's rambling lawyer in Liar, Liar, Bulworth can only tell the truth. This new freedom turns Bulworth on and he spews the ugly truth about politics: he tells mass media they are as corrupt as insurance companies; lambastes a black church for not having leaders; and riles the Jewish power elite of Hollywood. He enters South Central running away from advisors (including a bemused Oliver Platt) and mixing it up with a potential new girlfriend (Halle Berry) and a local boss (Don Cheadle). He offends across the board, even developing an inherent knack to rap his speeches. And the public loves it. The weekend becomes a clarifying point for Bulworth: he finds a reason to live. Beatty's rude and relevant comedy is a one-joke movie, but the joke is pretty good. It's a courageous film that is always sharp even though it loses narrative focus. Beatty's hilarious raps are so inspired they deserve repeated viewings. As usual, Beatty surrounds himself with a great crew, Ennio Morricone's music and Vittorio Storaro's cinematography being especially noteworthy. Beatty and Storaro even have the audacity to imitate two very famous photographs in the film's final seconds. The script by Beatty and Jeremy Pikser won the L.A. Film Critics award and was nominated for an Oscar.